Discussion in 'Coral' started by fishy408, Sep 28, 2018. Watching the BRS video, a good PAR range should be between 250-350. These numbers seems pretty hard to reach with my lights. Most of the rock work is about 8-9 inches down, where I'm getting only 230 PAR. When testing PAR, I did turn off the pumps and return pumps. Maybe I'm testing wrong? Or do those numbers seems to be about right? with pumps and returns off youll get higher par than with them on. id text with all flow on. what settings do you have your lights at? The good news and the bad. The good news is your PAR might be slightly higher because LEDs may not register the same as MH and T5's. I say might not because this statement always gets a long thread going. In any case, it's a significant amount (10-20%), but possibly not enough to make a huge difference in your case. So let's go through the bad news portions. First, every single Acro is different. BRS's recommendation is not a one size fits all. 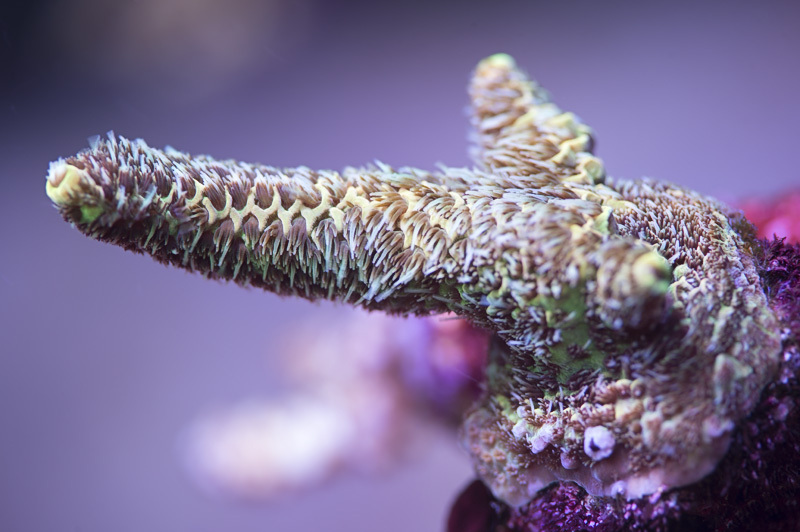 Many successful reefers keep some higher light Acros at as much as 500-600 PAR. That's an extreme, but most keep some "top of the tank" acros at at least 400ish. So at 250ish there's certainly some Acros you can keep, but often it's not going to be the hottest, craziest color acros which usually require higher PAR to fully color up. 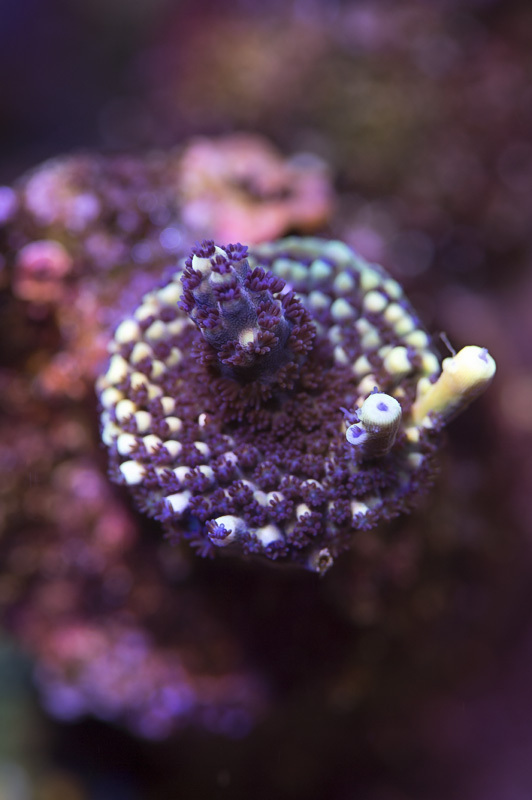 Now that doesn't mean you won't be successful, but you will not get near as much growth as the same corals under a better light and the colors may be (often more greenish) muted. I've never used Radion's but I believe I've read that the 30's are much better suited to SPS. Thanks Bruce. I took a quick trip to Neptune's to pick up another XR15, but they don't carry them. Do you think adding another would help? 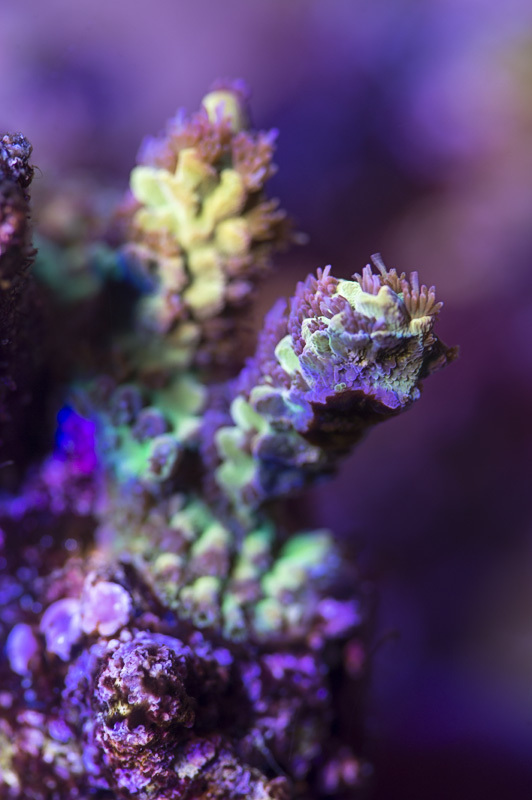 I have these acros, any comments on what PAR they should be at? Frankly, I don't remember your set-up exactly, but if it was me I might try to add a 2 or 4 bulb high quality T5 fixture. Other's may have a different opinion. 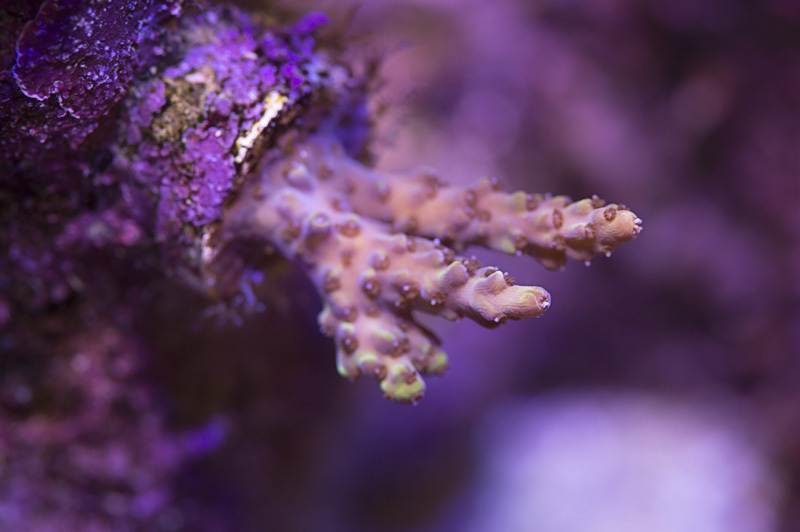 Lighting for SPS corals, in general, is achieve through intensity, duration, or the combination of both. If you can't hit the amount of PAR needed, then consider stretching out your lighting period for saturation. What you will find out is that you don't need that much intensity if you have longer duration of lighting. Also, quite a number of SPS don't require as much light as most people think. 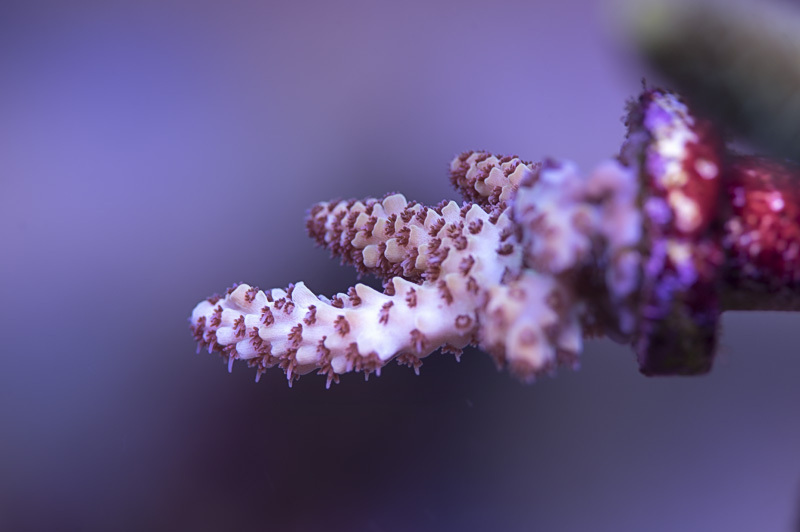 Here's the same coral, picked up at the same time, mounted at the same time, and grown in two separate areas. One sits on the sandbed and the other on the rockwork. RR The Vinh. The difference is very little to no difference in coloration between the two pieces. Macro shots gets into the nitty gritty that most people can't see with their eyes. As for PAR values, here are the PAR values for my current lights. 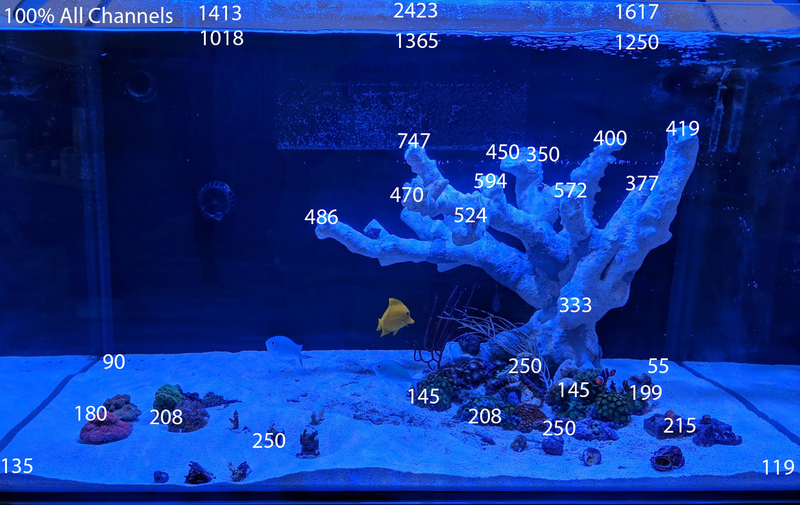 PAR values from 47G tank. Note values for where some of the SPS pieces are mounted at (outside of the 200+ range). 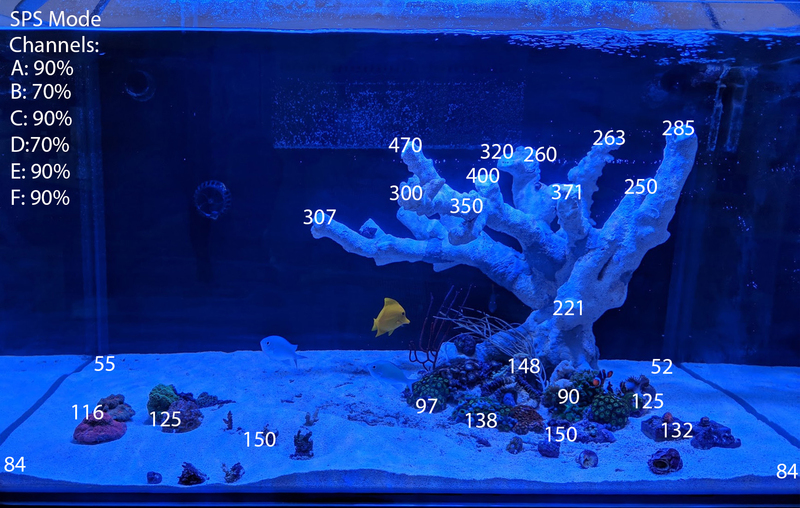 I can grow SPS on the sandbed in my current tank, but since you mentioned the above pieces, here's where I have some of them, or their equivalents. RR USA Orange Passion in current tank (~150 PAR). I've grown this one in 380 PAR before in last tank before the crash. No difference in color so far that I can tell. Both pops when the blues comes on. 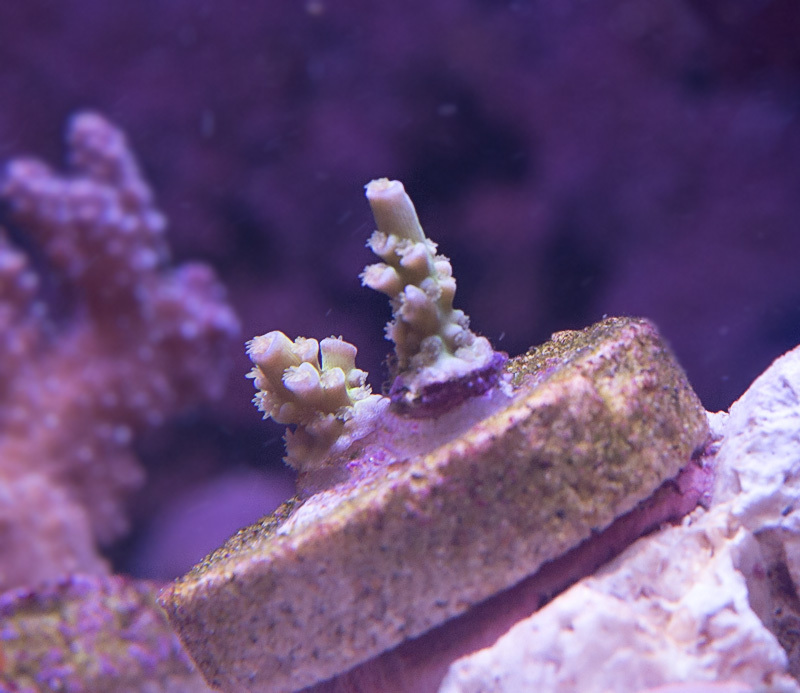 Same frag in ~200 PAR in old tank. 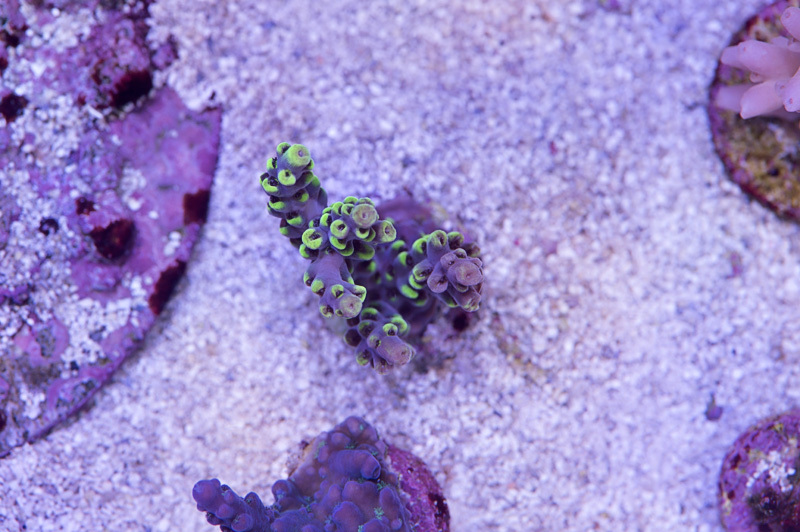 The pink/oranges on the body comes on as the frags get larger and they all start out with a greenish yellow base. 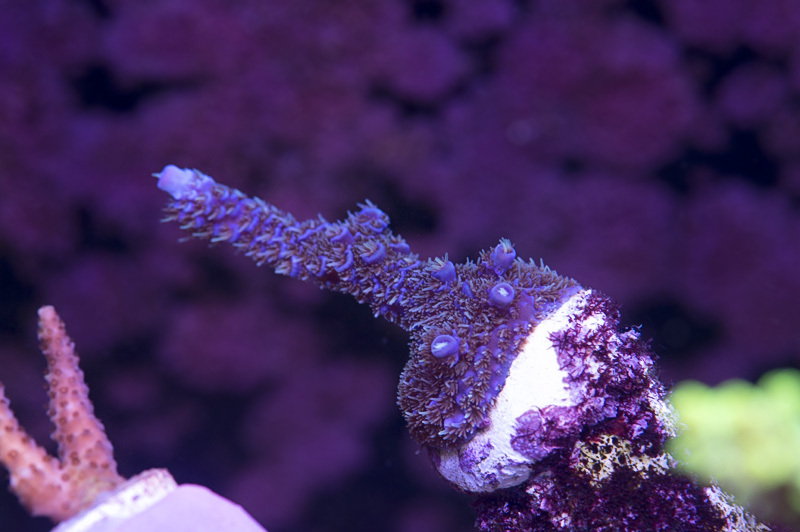 Polyp colors are there with frags and anything larger. You can see the colors coming in on the lone nub on the right there. Wolverine. Don't have this in current tank, but grew the last one in 180 PAR. This is my current equivalent, which IMO has better base color. Sits on sandbed at ~125 PAR. RR USA Wolverine in 180 PAR. Doesn't have the nice deep blue/purple body as in the wild above. ASD Rainbow. Never grown this one before in either tank, so can't comment. I'm growing 3 different milles in the tank current and their par values vary from 200-400 PAR. Wild Aussie mille. Mother is orange with yellow tips. Orange base slowly coming in, but I don't expect the frag to have same coloration as mother until at least mini colony in size. 300 PAR. Copps' 24k mille. 400 PAR. Kmooresf and fishy408 like this. Thanks for the reply. A lot of information to absorb. I noticed on the left side of one of the images (A,B,C,D,E,F) are those values equivalent to radion colors (blues, whites, red, green) or something different? The A-F are the 6 different channels on my Maxspect Recurve. In SPS mode (there are others for LPS and so on), those are the mixture from each of the channel (i.e., A: 90%, B: 70%, C: 90%, D: 70%, E: 90%, F: 90%), at their peaks. The lights are there for the majority of the day, but they do ramp up and down at the beginning and end of the day. It's one of the standard modes that the light ships with which I prefer (since it's not blue). It was basically a plug and play unit. Wow! Those whites and reds are really up there? My whites are at 25% and reds at 20%. Do you feel my whites and reds are too low? Also, yours don't have green? 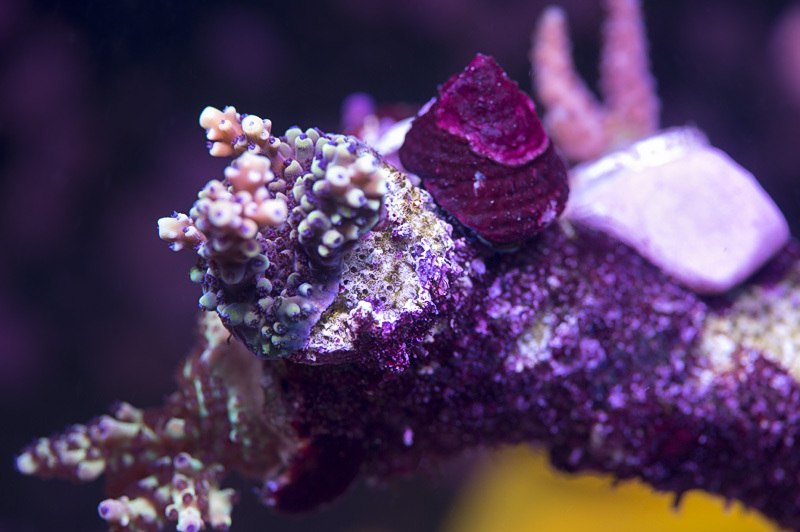 Corals utilize both white and red spectrum. Even when I had my AI Vegas I ran my white, red, and green channels at a decent level. IIRC my blues were 70%, whites were at 67%, and reds/greens were in the 40+. So yes, my whites and reds are really up there. If you're running those channels at those levels, especially the white channel, then you are losing quite of PAR. 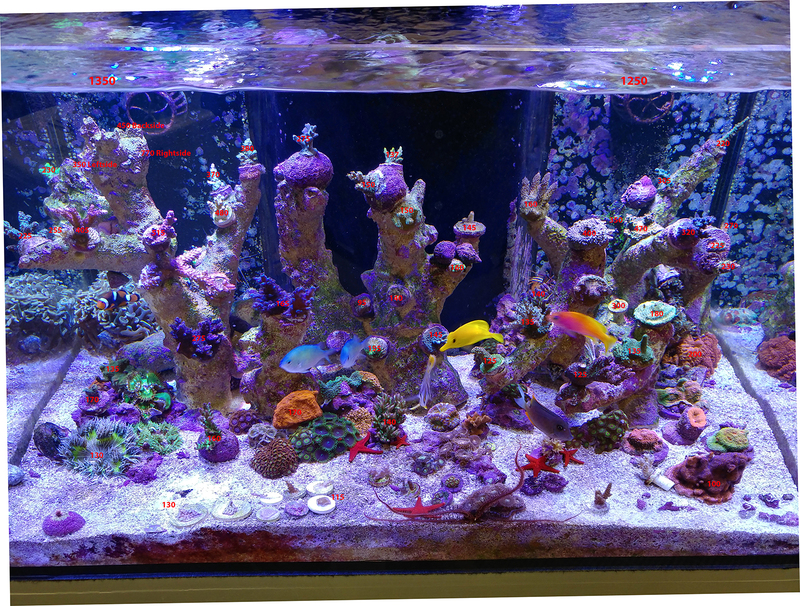 I would definitely bump the white (and red) channel up slowly to increase the amount of light going into the tank. My fixture doesn't have a dedicated green channel, but rather the channels blend itself to cover the spectrum. To give you an idea of what you're losing out with the channels not running full power, here's my fixture when all channels are at 100% (~200-250 on the sandbed down the middle where the main clusters are). fishdoctor and fishy408 like this. Looks like I need some adjustments. Thanks for the detailed responses, it was very helpful. Just remember to make changes slowly. I remember trying to make adjustments after reading different people's success stories, but it was just too much for my corals and even though I may have been adjusting it in a direction that was more beneficial for them, the change itself was more detrimental. I got very little growth for a long time. My new philosophy about it is that unless the lighting is actually harming the coral (like too much PAR) then I'll just set it and leave it. I attended a talk a few years back ( BAR speaker ) and I always thought sps did not like the reds ? Large amounts of reds is supposed to break down the growth process. Blue doesn't have that issue, but red light is still being used. Nobody actually knows how much red is actually too much. What I do know is that Sanjay uses a lot of reds in his tank (100% on all channels, including red) and if he can grow 1" colonies into 12"+ colonies, then I'm on board. His Radion schedule in pictures. I am seriously wary of red leds...maybe just superstitious, but I always keep them low. I do like blue looking lighting tho.